Over 200 patrons from Boulder and Denver converged on the Millenium Harvest House Hotel Sunday night for Chabad of Boulder’s Kosher Restaurant for a Night event. 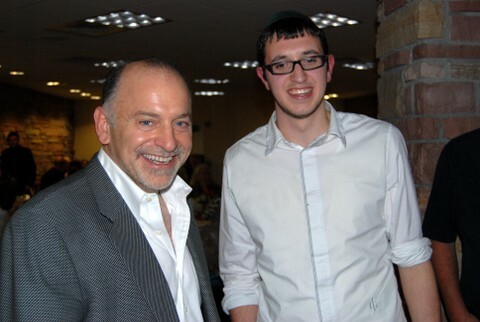 Mendy Scheiner, Rabbi Pesach Scheiner’s son, organized and ran the event with wait-staff made up of teens from the Boulder Jewish community. Chefs Ezra Cohen and Jessica Hersh provided the menu, which consisted of two prix-fixe entrees with choices of sides and dessert. The event was so successful that the hotel first set up more tables, then opened up a second room for the additional diners. Mendy is off to South Africa this week until Pesach, and we at the BJN wish him safe and healthy travels! Thanks for the wonderful coverage and great pictures. Just a note, while Mendy did a great job organizing it, there were many hosts and volunteers who made it a success. Also, Jessica Hirsch did a great job running the kitchen and helping with some of the food. Ezra Cohen's help was really appreciated as well. But, there were a crew of volunteers who helped with the cooking. Congrats! It looks like it was a beautiful event!